The Federation has shown to posses a lot of bypass systems and redundancy. Especially if you would consider what Voyager brought to the Federation after its journey to the Delta quadrant. If jammed, the ship's computers and engineers would find a bypass. The Federation's shields are vastly superior to those of the Rebel Alliance. The Federation uses antimatter power generation, while the Rebel Alliance is powered by fusion. This is a massive difference in power output that would be of benefit to shields, weapons, and other supporting devices. nanobot technology which, when transported, could be used to infiltrate enemy ships, disable technology or even attack the health of crew members. Both the Rebel Alliance and the Federation usually engage at velocities lower than light speed. At velocities lower than light-speed, Federation vessels enjoy a massive advantage and superiority at sub-light speeds. Federation computer systems seem more advanced then their Star Wars counter parts, able to perform more operations at once and to process things faster, allowing for a higher degree of automation. diagnostic program, with plans for other departments. Tactics over technology has historically been the deciding factor in battle. The Federation has rarely showed itself to posses any strategic thinkers or battle planners. Rebel spies stole the plans for the Death Star and could likewise steal plans for any technology and duplicate it for themselves. The Rebel Alliance's fighter craft are technologically superior to the Federations little selection of fighter craft, overcoming them in size ratio, speed/acceleration, and weapon systems. 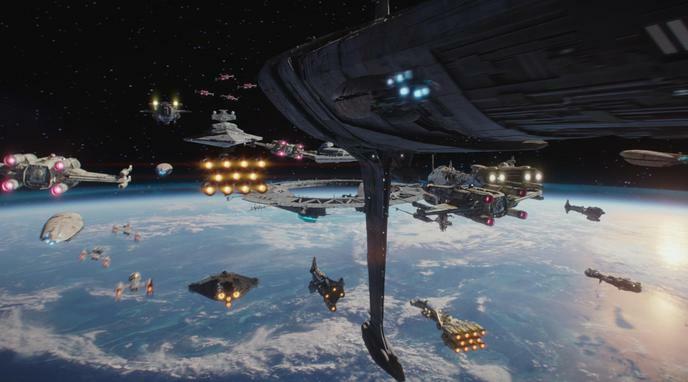 Federation ships are not equipped for anti-aircraft roles, which gives the Rebels an advantage. Rebel communication technology is superior to the Federations. The Rebels have real-time holographic technological communication to anywhere in the galaxy. The Federation has very good and very fast communication, but it is not real time and does suffer some delay and thus cannot compete with the Rebels. This would give the Rebels a coordination edge.